2) Looking south (into Liechtenstein) on the bike/walking path along the Rhine River. In other pictures on the Internet, there was a gate of some sort as recently as the early 2000s. As this picture shows, it was disassembled in September 2006. This pathway is on a levee near the bank of the Rhine. 3) Same location looking north into Austria. Pieces of the old gate are visible on the right. 4) A close-up of the marker and warning sign...warning that this is a crossing point for pedestrians and that one must possess ID and documents and cannot use this as a crossing point for transporting goods. Notice the border pole east of here just before the trees. 1) This picture is of marker #134 just west of the levee closer to the river. Looking up, the pathway markers are visible. 4) Marker #135, the closest marker to the Rhine River. Looking back marker 134 and the pathway markers are visible at the top of the photo. 1) Marker #135 with Rhine River behind. 2) Close-up of the sign marking the end of Liechtenstein. The tripoint is behind this sign in the middle of the river. 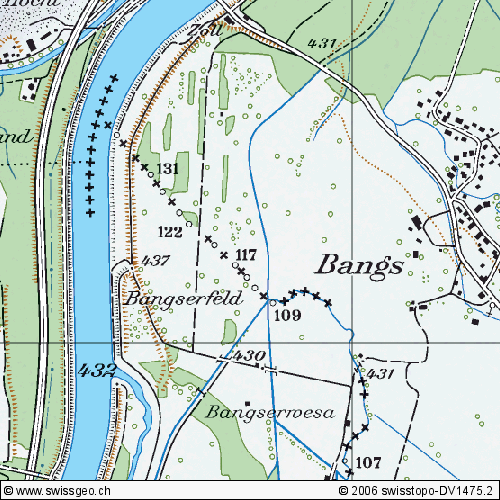 3) This is the small stone bridge over the border creek on the topo map above just SW of Bangs, Austria. The Liechtenstein reference markers are visible on the left, and the old Austrian customs building is just across the creek. 4) A closer view of the same location. 1) A close-up of the border bridge. 2) A close-up of the creek and edge of the bridge. The border is presumably in the exact middle of this picture. 3) Close-up of the Liechtenstein markers just south of the bridge. 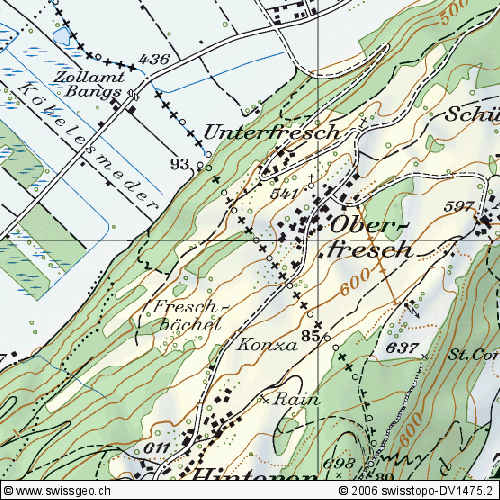 4) Close-up of the Liechtenstein reference marker #108--visible on the topo map above. 1) Same location...close-up of the old Austrian customs house and Austrian reference marker 108. 2) Looking across back into FL. 3) The town of Ruggell, Liechtenstein, welcomes its dear neighbors warmly...Hikers welcome to cross the border at this small bridge. 1) 1:25,000 topographic map of Ruggell crossing point and east. 2) Looking over the border stream into FL at the FL and Austrian customs buildings. At this point, the Austrian border station is inside Liechtenstein by a fair distance. 3) Looking the other direction, across the stream into Austria. 1) This is the point where the small track/hiking trail crosses from Unterfresch (A) into FL. Marker #90 is visible on the hill to the left. 2) Same spot looking across the track to the next border pole. 3) Close-up of marker 90. 1) At the official crossing on the paved road at Oberfresch. Looking toward Austria (North). 2) Signs showing the state border of Austria and the EU border. 4) Looking from Austria back into Liechtenstein (South). Border is very clear on the road. 1) Old border marker. Right-Austria, Left-FL. 1) View of the border crossing the footpath/track just east of the Oberfresch crossing. Marker #85 on right. 2) Austrian signs up close. 3) Border signs with marker 85. Looking south back into FL. 4) Marker 85 with marker 84 and pole in distance. 1) Close up of marker 85. 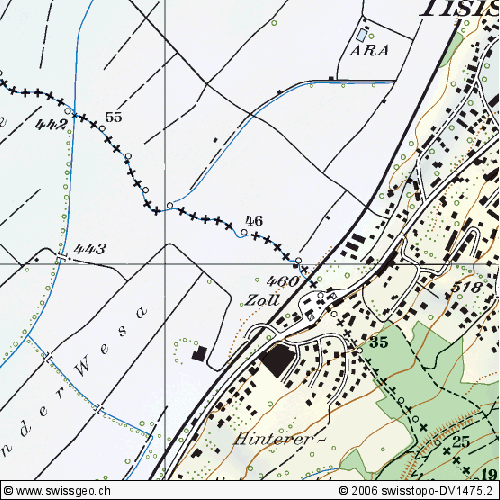 1) 1: 25,000 topo of the Tisis (Austria)-Schaanwald (FL) crossing. 2) Borderline across the road. 2) Directly across the street is the marker with coat of arms.